Stunning - and you can even learn how to make these yourself. I really admire artists. Never having been able to draw so much as a straight line (or a reasonable circle for that matter) I am in awe of those who can create magic with apparent ease, whether their medium is paint, metal or mixed media. Seattle glass artist Jesse Kelly manages to combine the form and sculptural qualities of foliage, fruit and flames with the luminosity of glass in such a way as to be truly compelling. From a distance his pieces draw you in – up close you marvel at the textures and colors. Jesse has been working in glass shops for 17 years, first as an apprentice to learn the intricate glass blowing skills and finally running his own business. His Mom is also a glass artist so Jesse has had many opportunities to learn from the best. Indeed Jesse’s willingness to learn from a number of mentors and be exposed to new ideas and techniques has proved to be his strength. Rather than becoming complacent with his success he continues to challenge himself to develop new finishes, shapes and designs. 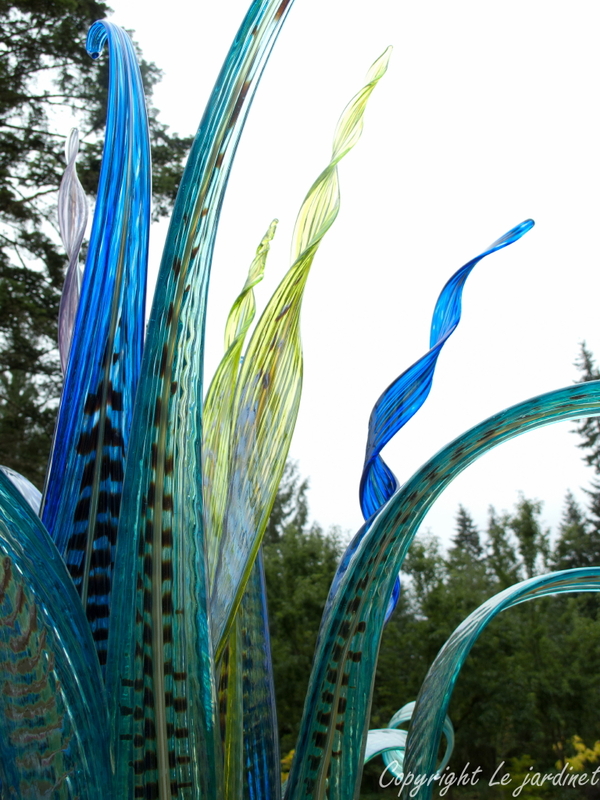 With larger installations and displays in the magnificent Dunn gardens, the Museum of Glass in Tacoma and Shack Center of Arts in Everett his work is receiving increasing recognition and appreciation. will be quite the conversation piece. One series which I especially love is his line of bamboo in black, gold or bright green. 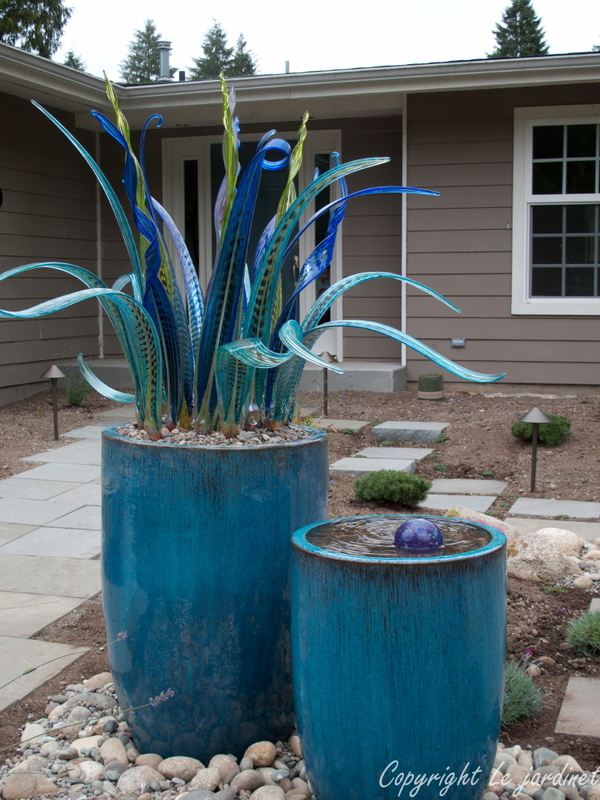 These pieces are made of interlocking glass segments threaded onto rebar. 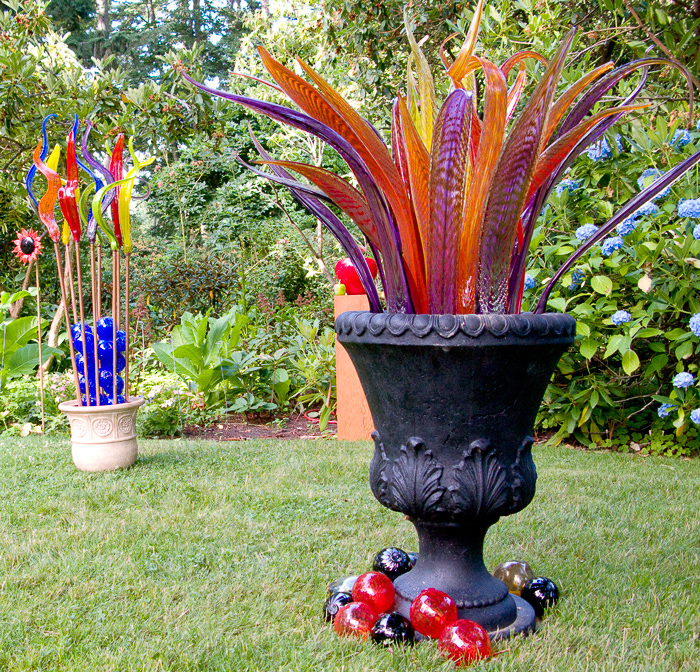 Easily secured into the ground and winter hardy, these glass bamboo canes make striking accents in the garden. The depth of color, shimmer and subtle shading at the nodes is exquisite. Even better - they aren’t invasive! Glossy, intense colors - irresistible. 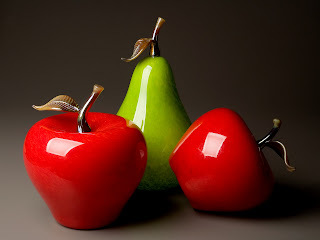 For sheer strength of color, his fruit are unsurpassed. Apples, pumpkins and pears in shades of red, orange and green are available in sizes ranging from 3” to 36”, with Jesse happy to make them in any size or color to suit budget and space. The smaller pieces look fabulous displayed in a bowl or table top while larger ones would make a fun marker at the entrance to a vegetable plot or as a border accent. I was drawn to the glass Yuccas however. We asked Jesse to custom design one for us in shades of blue, aqua, green and soft purple. He has installed it in a deep turquoise container which we had already purchased and the result is magnificent. 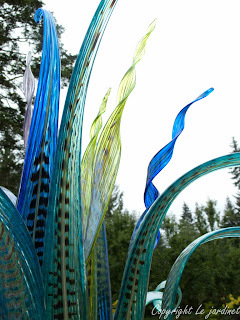 Each blade is unique in color and shape, from opaque cobalt blue with a little curlicue at the end, twisted translucent pieces in soft purple and a most beautiful shade of opalescent aqua with a bronze feathering embedded within the glass. As the light catches the composition at different angles throughout the day it shimmers and sparkles; a wonderful focal point for the entrance to our home. designed for us as part of a water feature. Here’s a real treat though. 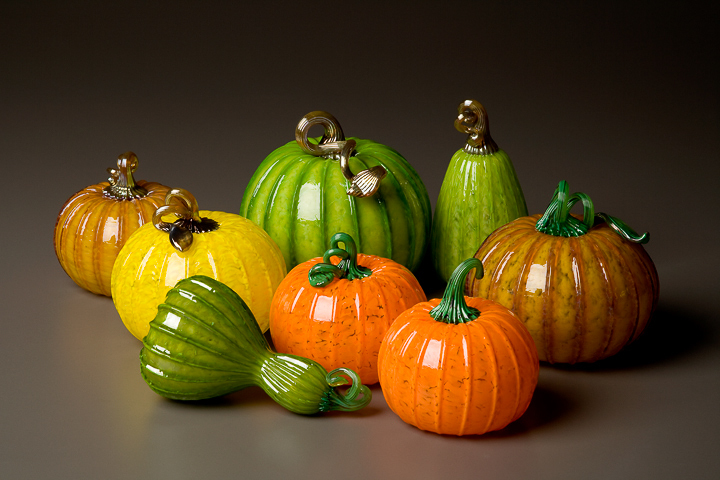 Jesse holds glass blowing classes at his Seattle workshop and has several planned between now and the New Year. Be sure to check his website or email him for details. What a wonderful gift for yourself or friends. Jesse’s work can be seen and purchased from nurseries throughout the Greater Seattle area but he loves working directly with customers and can be contacted through his website. Why settle for the ordinary when something extraordinary can be made just for you? 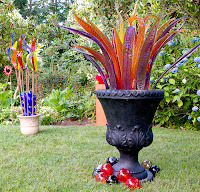 I would like to purchase some glass art for my garden. Do you have peaces for sale? Also, if I could see on line and the prices. Fall Fever – keep it HOT!